Perfect for small spaces, this stand can be used for a variety of purposes. Its simplistic design features two tiers: a lower tier for decorative items or keeping essential items easily accessible, and the top tier is ideal for a laptop. Set on top of four rolling wheels, the stand can be moved with ease; use it while seated or when standing, and easily roll it away when not in use. The flush, flat panel drawer offers additional, out-of-sight storage for CDs, chargers and other small accessories. Available in Dark Cherry. Classic design combines traditional appeal with simple refinement; and that describes the exact approach taken by the creators of this entertainment unit. The durability of the birch wood veneer and tempered glass shelf balances transitional design and true functionality. The medium brown finish and silver trim give it a modern industrial look that fits well with nearly any existing theme. The slightly splayed legs provide support and stability, while the 2-tier shelving offers ample space for keeping movie watching essentials at hand. Whether you choose this TV stand for its modern, contemporary style or for its versatility and practicality, it's sure to complement and complete your entertainment space. Modern and clean define this telephone stand. 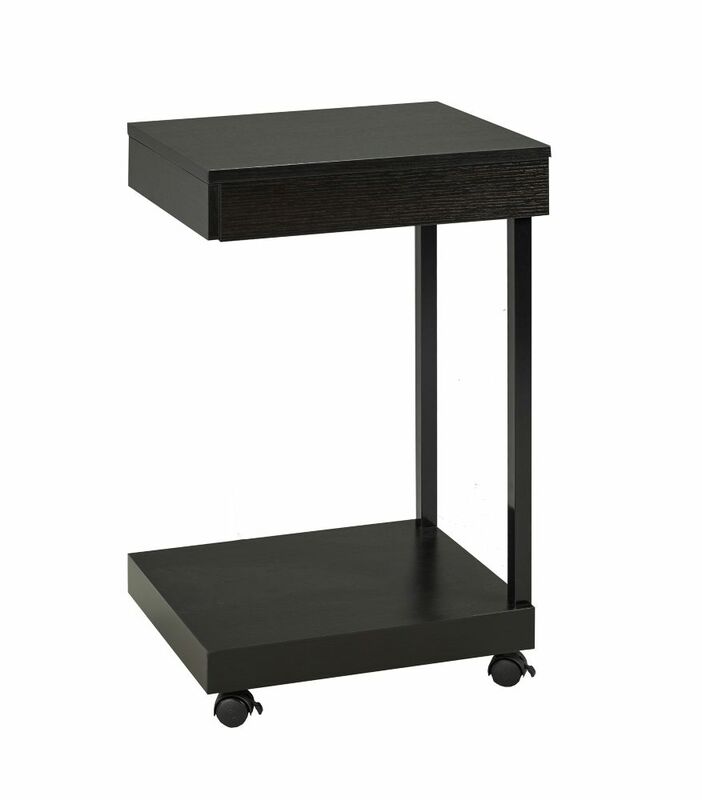 Its black finish, square shape and tapered legs add subdued sophistication to your space. The unique drawer design provides added functionality with hidden storage to reduce clutter and handy dual cup holders built right in. Use the table top as your home's central communication base; a place for your home phone or mobile phone charging station. Available in Midnight Black. 3-tier plant stand accents a small space or creates a decorative display. Great for tall and extra tall blooms. Crafted of solid wood harvested from the Cypress tree family with decay resistance similar to Western Red Cedar. Moisture resistant for maximum weather protection. Easy-to-assemble. Laptop Stand with Storage Drawer, Dark Cherry Perfect for small spaces, this stand can be used for a variety of purposes. Its simplistic design features two tiers: a lower tier for decorative items or keeping essential items easily accessible, and the top tier is ideal for a laptop. Set on top of four rolling wheels, the stand can be moved with ease; use it while seated or when standing, and easily roll it away when not in use. The flush, flat panel drawer offers additional, out-of-sight storage for CDs, chargers and other small accessories. Available in Dark Cherry.